Chai4ever's special summer program -- just for children living with parental illness -- brings back the joy of childhood with friendship, excitement and fun in a supportive setting. Peers who are experiencing similar challenges and specially trained staff help create cherished memories that last a lifetime. 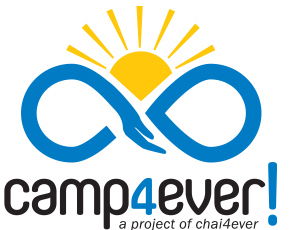 Chai4ever changes the face of illness for nearly 1,000 patients and 3,000 children with practical assistance in the home, from meals and housekeeping assistance to volunteers that help with grocery shopping and homework. It keeps patients and their children afloat with counseling, insurance advocacy, medical referrals and transportation to and from medical appointments. Recreational events including holiday parties, family events, big brothers and sisters and Camp4ever!, a summer camp exclusively for children struggling with a parent's serious illness, lift spirits and build a community of encouragement and strength for thousands of children. Apply your energy, enthusiasm and ingenuity to being a 'Raiser! You can team up with family or friends or go it alone.